Traditionally drilling rig shacks are heated with 350,000 btu/hr diesel fired heaters. They run continuously at full capacity no matter the outside temperature. This results in a tremendous waste of fuel. Drilling companies are becoming more and more concerned about their environmental impact, and of course bringing fuel into remote locations is costly. This has driven them to search for a solution that reduces fuel consumption while maintaining their operators’ comfort. 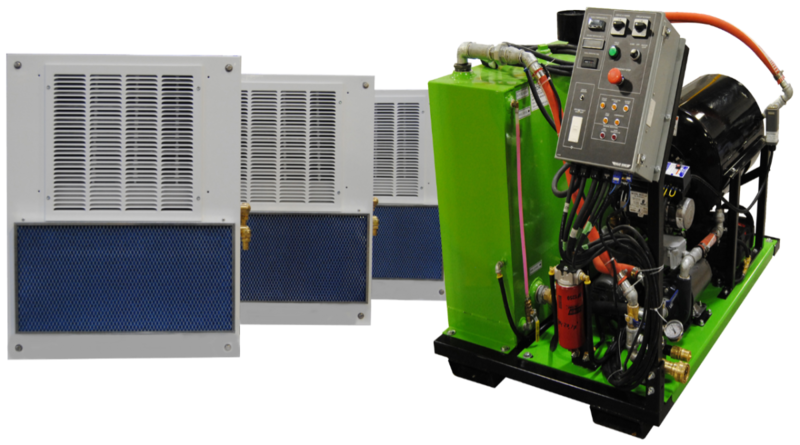 At Heat King, working with a large mining drilling company, we have developed an economical solution. It consumes only the fuel required to maintain a comfortable temperature within the shack, whether the outside temperature is above freezing or -40º. This rugged and reliable product result is fuel savings of up to 50%. A core glycol heating unit is placed in the machine shack which maintains a reservoir of heated glycol. It pumps fluid into the drill shack which has three purpose designed, wall mounted, and thermostatically controlled heat exchangers. By matching the heat output to the demand, the system delivers from 0 to 300,000 BTU/hr into the shack.